Why "Religious Freedom" Bills Are The New "Stand Your Ground"
The Article: These “Religious Freedom” Bills Are the New Stand-Your-Ground Laws by Eric Sasson in The New Republic. The Text: Awaiting signature on the desk of Arizona Governor Jan Brewer is a bill that might be the most insidious attack on LGBT rights to ever pass both houses of a state legislature. SB1062 would allow anyone—be it an individual, association, partnership, corporation, church, religious assembly, foundation, or other legal entity—to deny services to others simply by asserting their religious beliefs. 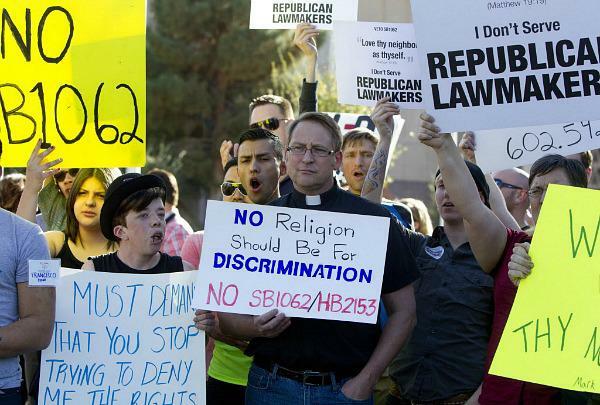 Interpreted broadly, the bill could override many equal protection clauses in Arizona law, including civil rights: A restaurateur could deny service to an out-of-wedlock mother, a cop could refuse to intervene in a domestic dispute if his religion allows for husbands beating their wives, and a hotel chain could refuse to rent rooms to Jews, Hindus, or Muslims. Republican legislators have made the intended target of the bill clear in their statements, repeatedly citing a New Mexican photographer who was sued when he refused to shoot a lesbian couple’s commitment ceremony. They claim the bill’s detractors are exaggerating its possible effects and are demonstrating hostility towards people of faith. But there is ample reason to believe that a law like this would open the door to discrimination. Once laws are passed, people who may otherwise be afraid of engaging in questionable behaviors may feel emboldened to do so. Moreover, these laws will likely be used by juries as legitimate reasons to dismiss cases against future defendants—after all, the law is the law. Furthermore, SYG defenses are shockingly successful. Seventy percent of people who have invoked the defense have avoided prosecution. In fact, SYG laws seem to have tilted the odds in favor of the shooter: In states that have it, 13.6 percent of homicides have been ruled justifiable, while in those that don’t, only 7.2 percent have been deemed such. Unsurprisingly, the success of a SYG defense has a decidedly racial bias—white-on-black killings are far more likely to be deemed “justified” than any other kind. What does this all mean for bills like SB1062? Granting people the legal right to invoke religious beliefs to justify their right to refuse service will embolden many people who might have otherwise been afraid to do so. Moreover, the defense could end up being a largely successful one. Certainly jurors who might already be biased will be unafraid to side with the defendants, but even those who might not agree with the law will be hard pressed not to accept its validity; should a defendant make a somewhat rational case for why their religious beliefs would be violated by providing these services, the jurors would be forced by the law to acquit. The law would not only provide cover to judges and juries who might otherwise harbor sentiments against the defendants for whatever reason, but would even compel those who aren’t biased to rule in favor of the accused parties. Many have compared these laws to the gay propaganda bill that passed in Russia last June, some expressing dismay that such laws could be enacted here in America. In the sense that the Russian law seems to have emboldened many Russians to hunt down LGBT people (a law recently passed in Nigeria seems to doing the same thing), it’s not hard to draw the same conclusions here. These Republican legislators claim to want to protect people of faith, yet they did not invoke a single legitimate instance where a person’s freedom of religion is compromised by having to serve others. Purporting to be against discrimination, these lawmakers are trying to use the victim card against the very people they want to discriminate against. Yet there is a tacit social contract we all sign in pluralistic societies: Even when we do not agree with everyone’s beliefs or lifestyles, we still agree to treat each other fairly. There’s something vaguely desperate about these laws, the last gasp of a cause aware that it’s dying. They are unlikely to pass constitutional muster; they hardly seem to be trying to do so. In all likelihood, Brewer will veto SB1062. As law, it would not only cause a ridiculous pileup in the courts but could tear at the social fabric of the state, exposing certain prejudices that best remain hidden—the landmines are too numerous for the governor to risk so late into her term. Still, this will hardly be the last we hear of these dubious “religious freedom” arguments. Every step in the civil rights movement was met with resistance. Now that the push for LGBT rights has gained such momentum, the backlash will only get stronger.